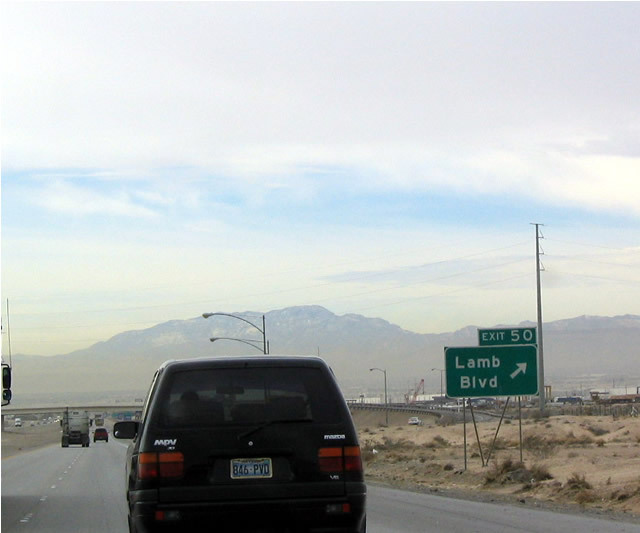 Southbound Interstate 15 and U.S. 93 approaching Exit 50, Nevada 610 south/Lamb Boulevard. Nevada 610 extends from Interstate 15 south to Interstate 515 and is a more direct, if not slower, route for through traffic on U.S. 93. Photo taken 02/16/04. 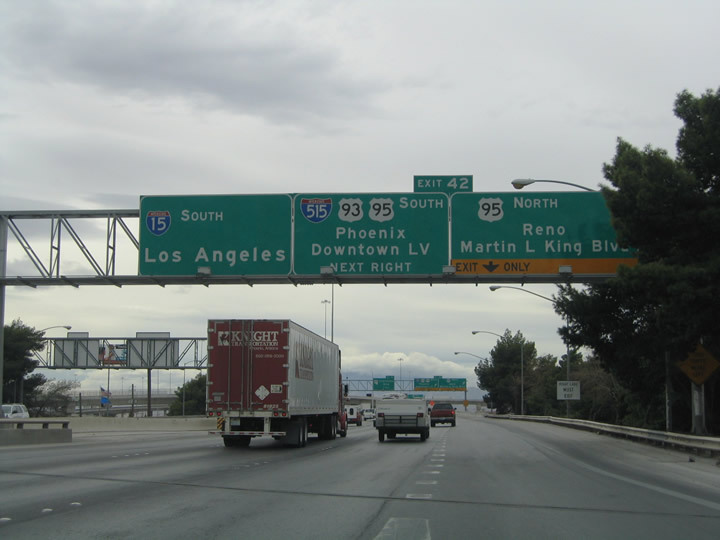 Exit 50 departs Interstate 15 southbound in the form of a partial "Y" interchange. Nevada 610 (Lamb Boulevard) meets Nevada 573 (Craig Road) in 1.6 miles, Nevada 604 (Las Vegas Boulevard) in 2.6 miles, and Nevada 147 (Lake Mead Boulevard) in 4.7 miles. Nevada 610 northbound defaults onto Interstate 15 northbound ahead of junction Clark County 215. Photo taken 02/16/04. 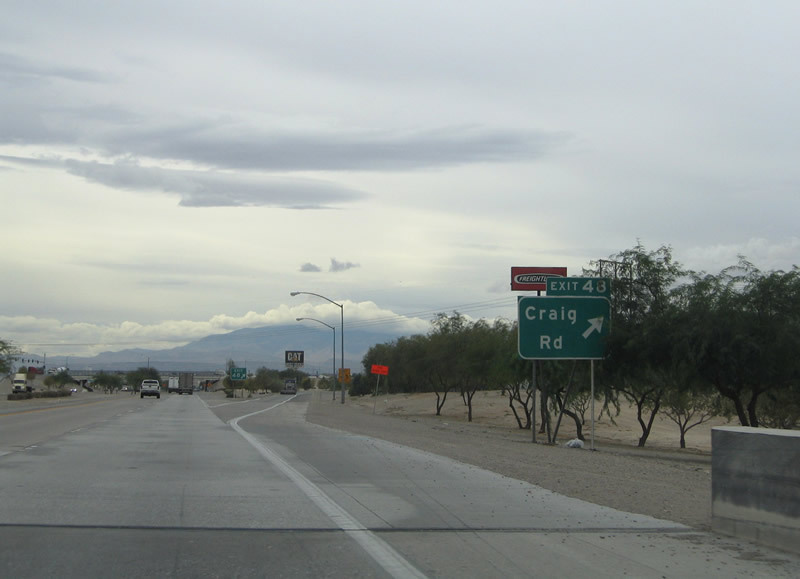 The next exit along southbound Interstate 15 and U.S. 93 is Exit 48, Nevada 573, Craig Road, one mile. Craig Drive comprises an east-west surface arterial between Buffalo Drive and Nevada 604 (Las Vegas Boulevard). Photo taken 02/16/04. 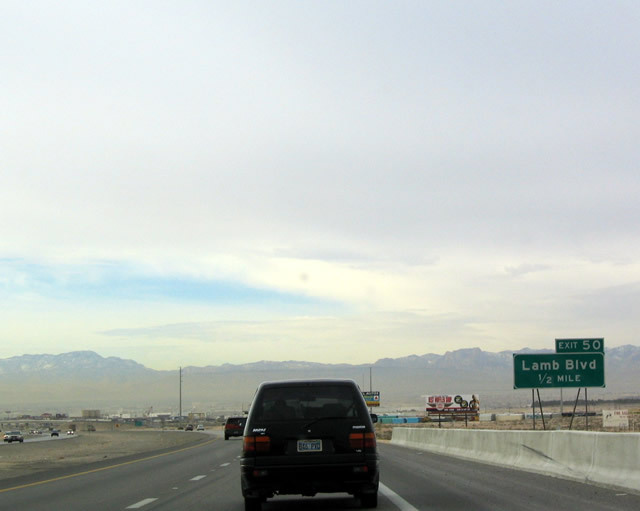 Mileage sign along southbound Interstate 15 and U.S. 93 for the next three exits, all of which serve the city of North Las Vegas: Exit 48, Nevada 573/Craig Road; Exit 46, Nevada 574/Cheyenne Avenue; and Exit 45, Nevada 147/Lake Mead Boulevard. Photo taken 02/16/04. 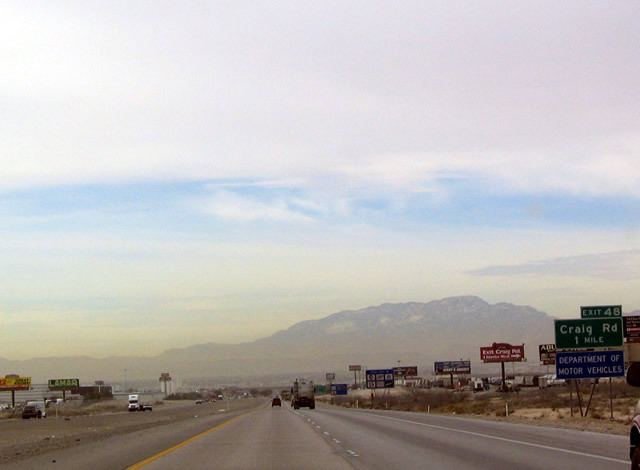 Southbound Interstate 15 and U.S. 93 at Exit 48, Nevada 573/Craig Road. Nevada 573 leads east to meet Nevada 604/Las Vegas Boulevard near Nellis Air Force Base; Nevada 573 leads west into North Las Vegas. Photo taken 10/19/04. Tagged Interstate 15 & U.S. 93 southbound reassurance markers posted after the Exit 48 partial-cloverleaf interchange. Photo taken 10/19/04. 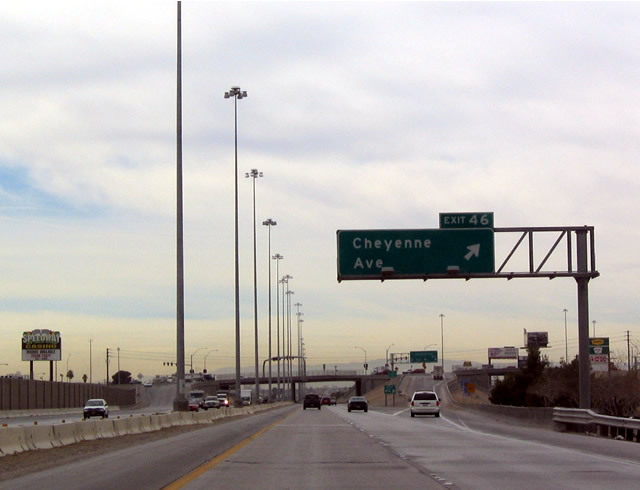 The next exit along southbound Interstate 15 and U.S. 93 is Exit 46, Nevada 574/Cheyenne Avenue. Nevada 574 leads west through North Las Vegas to the North Las Vegas Airport and U.S. 95. Heading east, Nevada 574 connects with Nevada 604/Las Vegas Boulevard, Nevada 610/Lamb Boulevard, and Nevada 612/Nellis Boulevard. Photo taken 02/16/04. Travel Nevada 574 (Cheyenne Avenue) eastbound for Civic Center Drive, the Community College of Southern Nevada, and the Cheyenne Sports Complex. Photo taken 10/19/04. 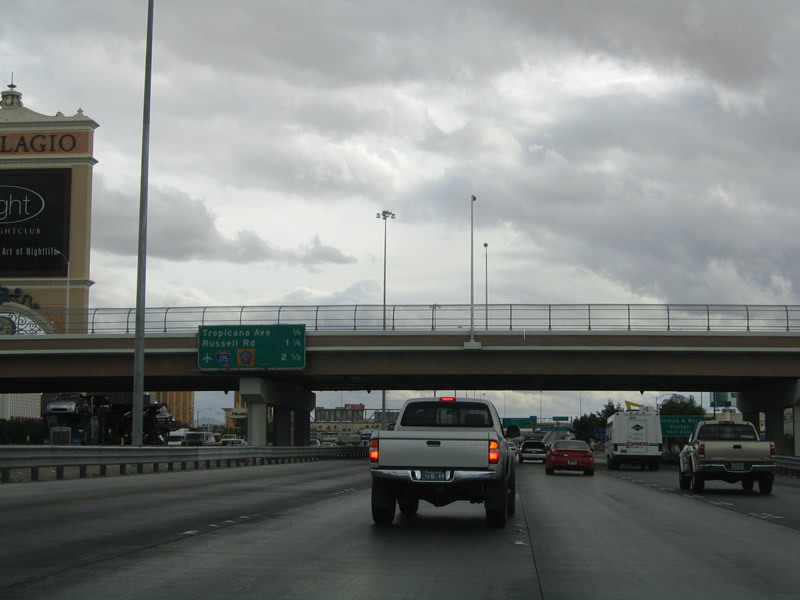 A single point urban interchange (SPUI) facilitates the movements between Interstate 15 & U.S. 93 with Nevada 574 (Cheyenne Avenue). 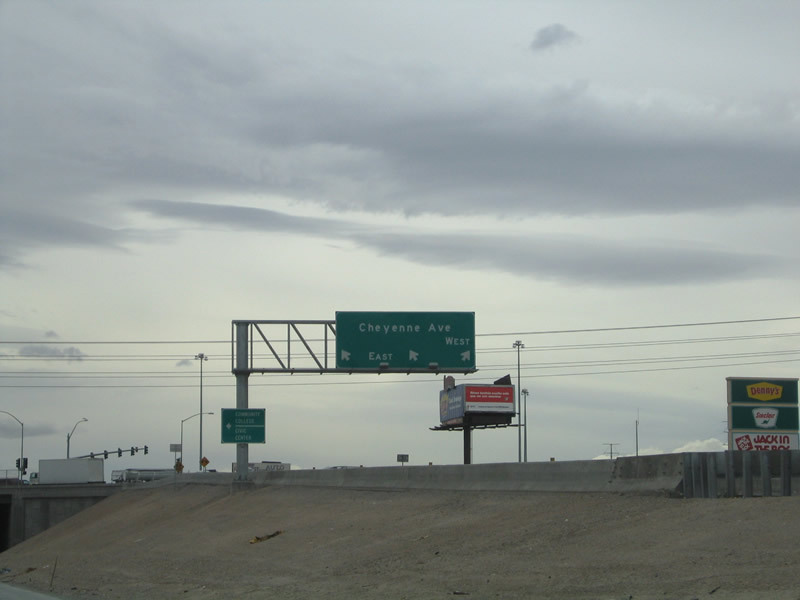 Cheyenne Avenue comprises a surface arterial from the Las Vegas Beltway (Clark County 215) to Nevada 612 (Nellis Boulevard). Photo taken 02/16/04. Looking up at the Exit 46 ramp partitioning to Nevada 574 east and west. Cheyenne Avenue west intersects Martin Luther King Jr. Boulevard in 2.1 miles and U.S. 95 Business & Nevada 599 (Ranch Drive) in 4.9 miles. 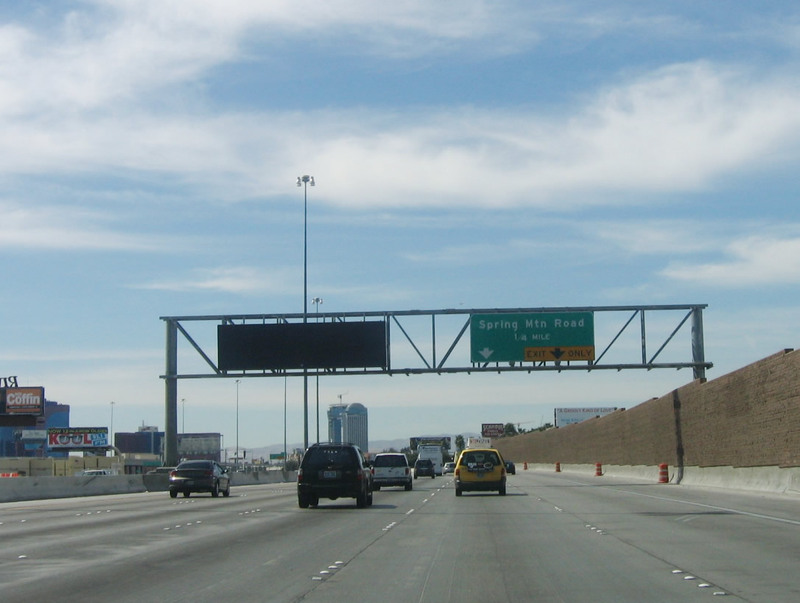 Nevada 574 eastbound meets Nevada 604 (Las Vegas Boulevard) in 1.7 miles. Photo taken 10/19/04. 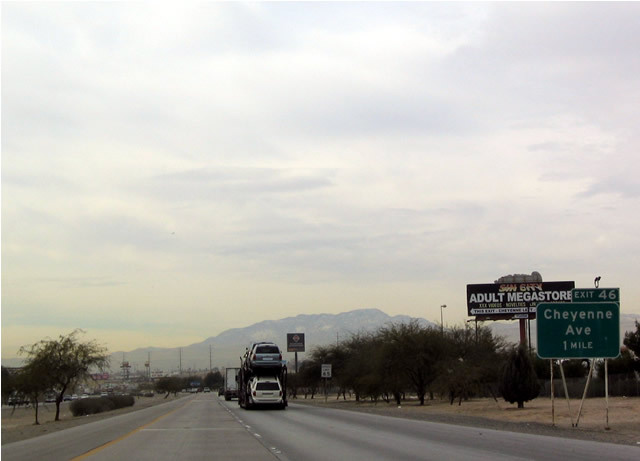 The next exit along southbound Interstate 15 and U.S. 93 is Exit 45, Junction former Nevada 147 (Lake Mead Boulevard). Lake Mead Boulevard begins near the Las Vegas Beltway and travels east through Summerlin to to Lake Mead and Lake Mead National Recreation Area. All of the east-west road carries at least four lanes with a median divider. Photo taken 02/16/04. Carey Avenue passes over Interstate 15 & U.S. 93 one quarter mile ahead of the directional-cloverleaf interchange with former Nevada 147 (Lake Mead Boulevard). Nevada 147 officially totals 14.755 miles of Lake Mead Boulevard from the eastern urban limits of North Las Vegas to Lake Mead. Signs along Interstate 15 omitting the shield are correct. Photo taken 10/19/04. 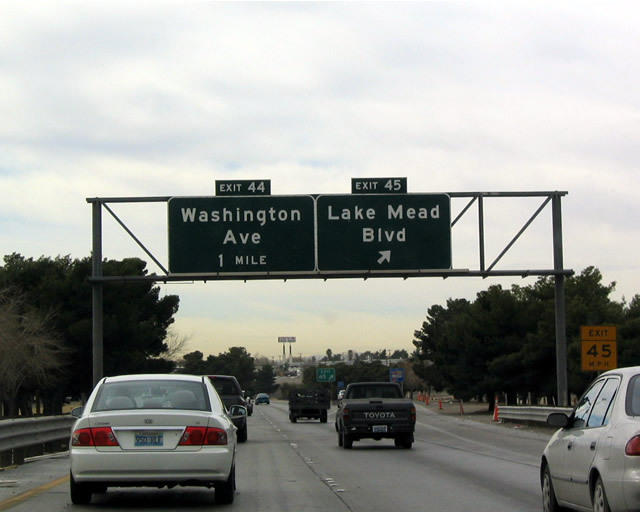 Exit 45 departs Interstate 15 & U.S. 93 southbound for Lake Mead Boulevard. Lake Mead Boulevard heads 17 miles east to Northside Drive (former Nevada 167) within Lake Mead National Recreation Area. These old overhead signs date back to the original freeway construction, and the dark green background is very similar to signs used in California. Notably, button copy was not used on these signs. The next exit is Exit 44, Washington Avenue/D Street. Photo taken 02/16/04. 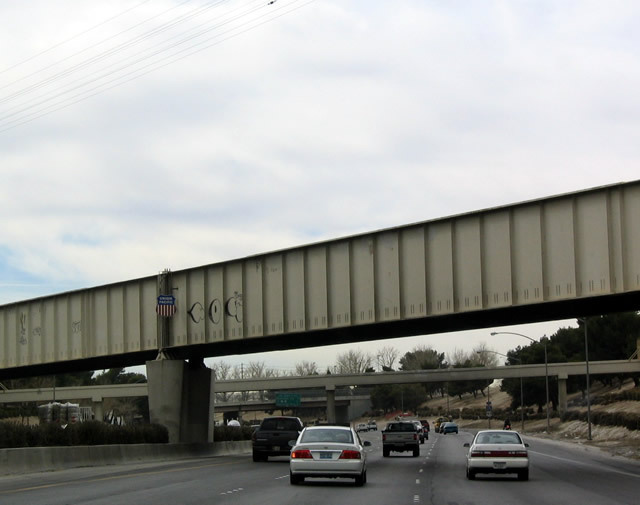 The Union Pacific Railroad, which has paralleled southbound Interstate 15 since near Glendale, crosses over Interstate 15 and U.S. 93 at this bridge between Exits 45 and 44. Photo taken 02/16/04. 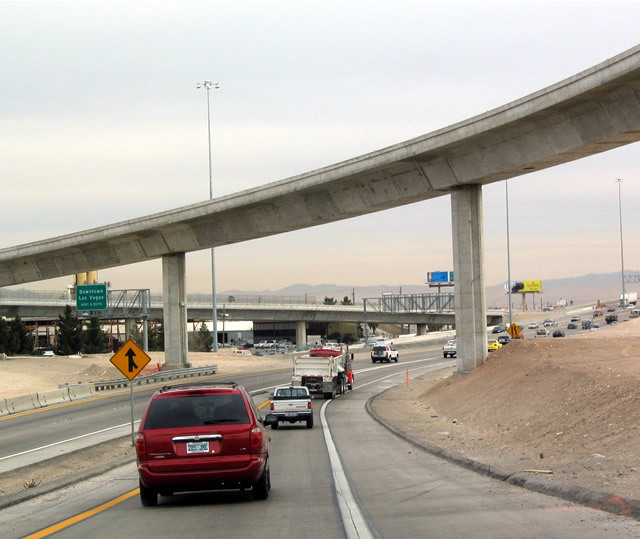 Leaving North Las Vegas and entering the city of Las Vegas, Interstate 15 and U.S. 93 widen out with a substantial median before reaching the Interstate 515/U.S. 95 interchange. 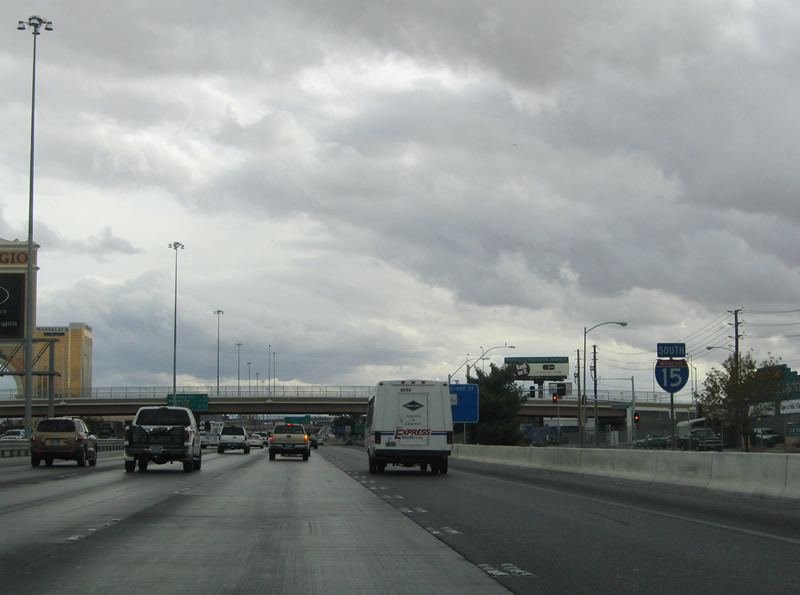 The wider median allows for traffic from Lake Mead Boulevard (former Nevada 147) to merge into the left lanes of southbound Interstate 15 and U.S. 93. Photo taken 10/19/04. 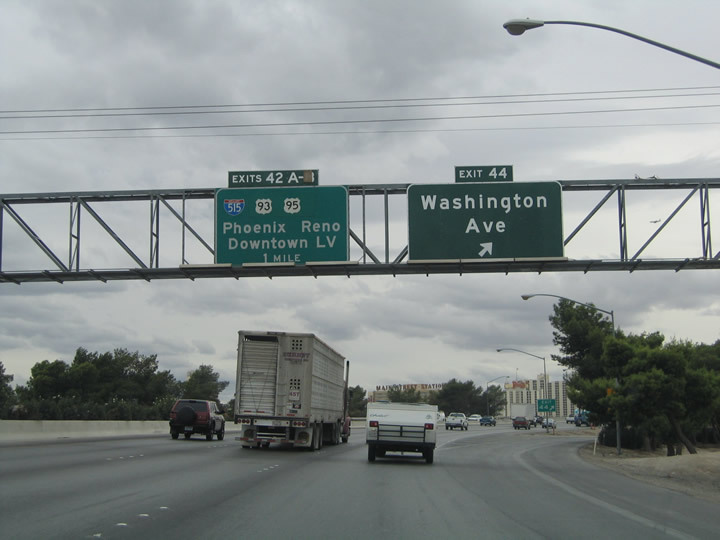 Now entering downtown Las Vegas, Interstate 15 approaches the three exits into the city of Las Vegas: Exit 44, Washington Avenue/D Street; Exit 43, Interstate 515/U.S. 95; and Exit 42, Nevada 159/Charleston Boulevard. Owens Avenue passes over the freeway at the city line. Photo taken 02/16/04. In addition to Washington Avenue, Exit 44 also serves D Street and the Cashman Center, which is located at the southwestern corner of Maryland and Washington. Cashman Field, a 10,000 seat baseball stadium, resides within the complex. The venue is home of the Las Vegas 51's Triple A Baseball franchise. 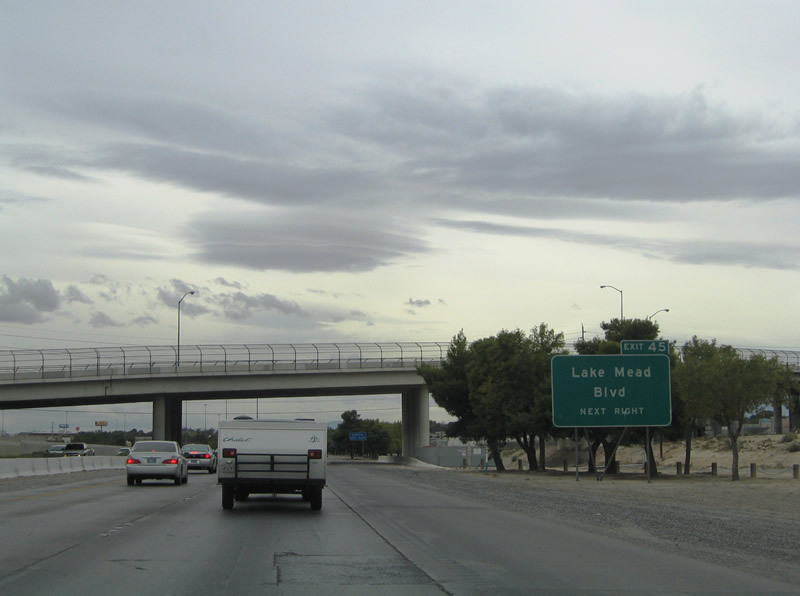 The Exit 44 split-diamond interchange also entails D Street, a north-south road between Bonanza Way and Lake Mead Boulevard. Photo taken 10/19/04. 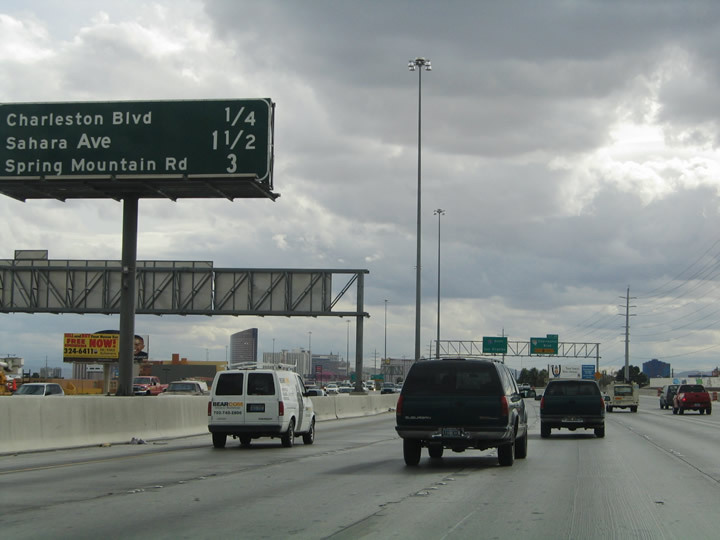 Southbound Interstate 15 and U.S. 93 at Exit 44, Washington Avenue/D Street to downtown Las Vegas. The next exit is Interstate 515/U.S. 93-95 South. 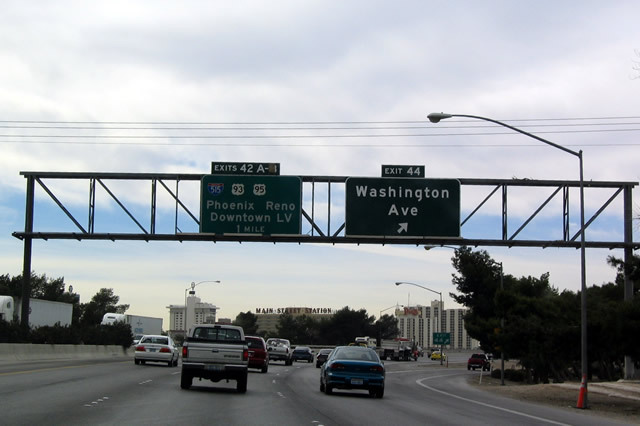 Washington Avenue constitutes an east-west surface arterial between Interstate 15 and Nevada 612 (Nellis Boulevard). Again, note these older signs feature no button copy but are originals that date back to the construction of the freeway. Photos taken 02/16/04 & 10/19/04. Southbound Interstate 15 and U.S. 93 approaching Exit 42, Interstate 515/U.S. 93-95 South and U.S. 95 North. 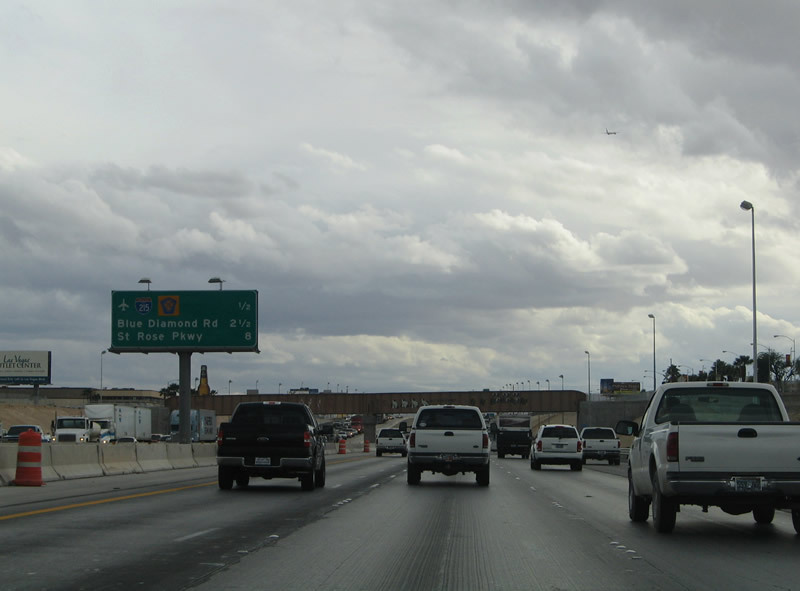 Interstate 15 continues south on its own toward the Las Vegas Strip and Southern California. 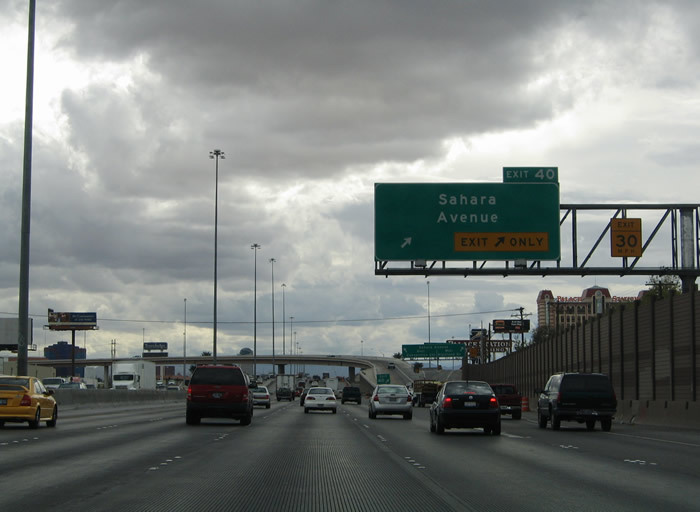 Meanwhile, Interstate 515 is a freeway as far south as Henderson, but with future plans to extend the freeway around Boulder City and over the Hoover Dam bypass, a four-lane connection to Interstate 40 and possibly Phoenix may not be out of the question. Photo taken 10/19/04. 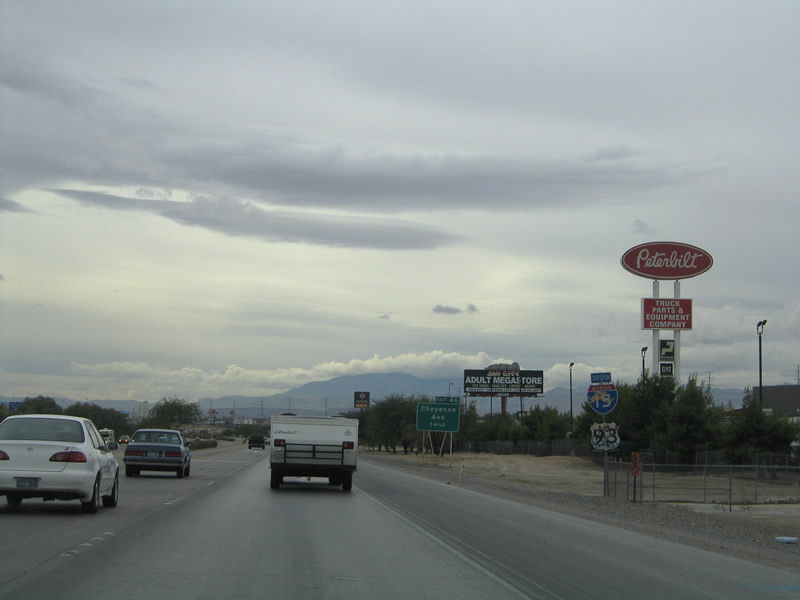 Southbound Interstate 15 and U.S. 93 at Exit 42, Interstate 515/U.S. 93-95 South to Henderson, with U.S. 95 continuing south to Laughlin and Needles and U.S. 93 continuing to Boulder City, Hoover Dam, and Kingman. 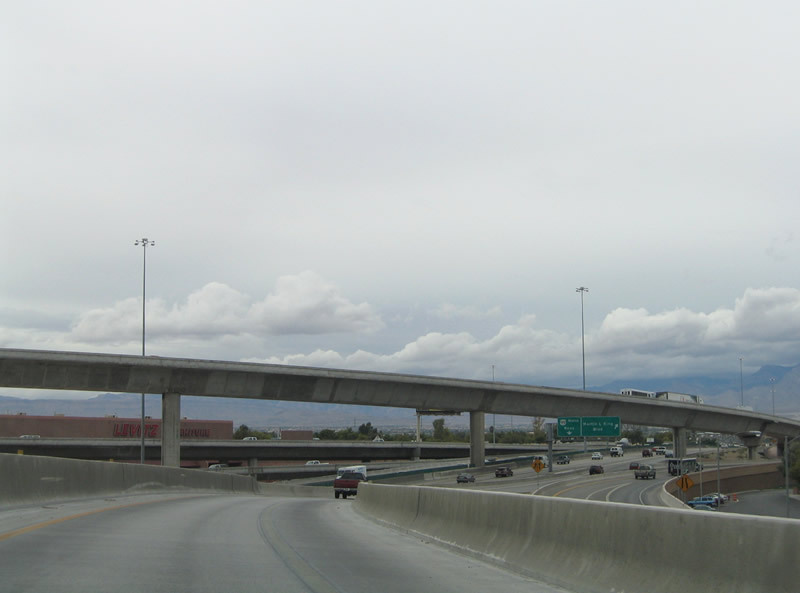 This ramp also leads to U.S. 95 North to Summerlin, Beatty, Tonopah, and Reno (via Interstate 80). 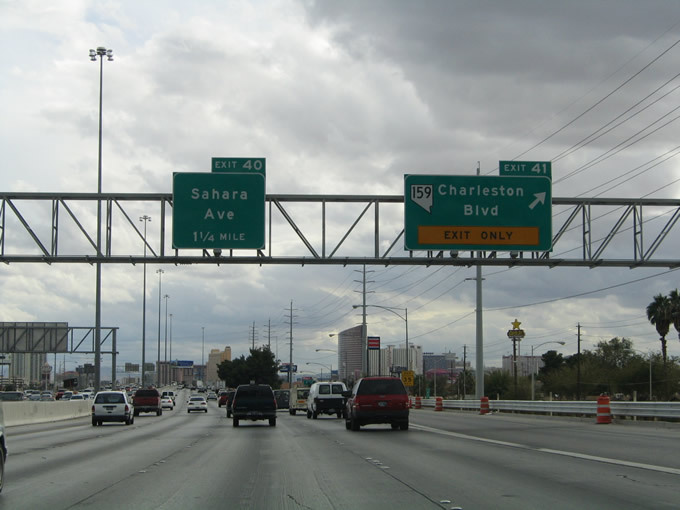 The next exit along southbound is Exit 41, Nevada 159/Charleston Boulevard. Photo taken 10/19/04. The Spaghetti Junction interchange, which connects Interstate 15, Interstate 515, U.S. 93, and U.S. 95, was reconstructed in the late 1990s and early 2000s. 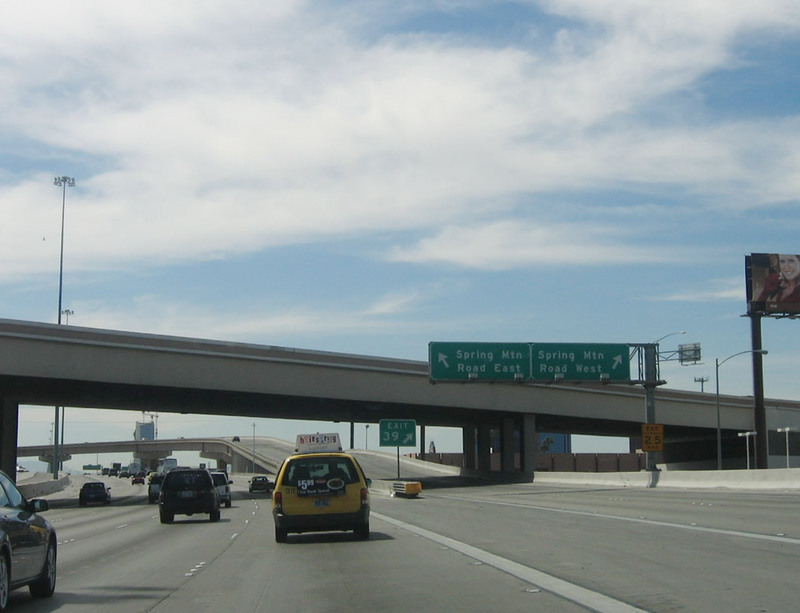 This ramp carries the transition from southbound Interstate 15 to southbound Interstate 515 and northbound U.S. 95; in addition, this ramp is the mainline for U.S. 93 south. Photo taken 10/19/04. View of transition ramp from southbound Interstate 15 onto southbound Interstate 515. This marks the northern terminus of Interstate 515. Photo taken 02/16/04. Continuing along the northbound on-ramp to U.S. 95 from Interstate 15 & U.S. 93 southbound. 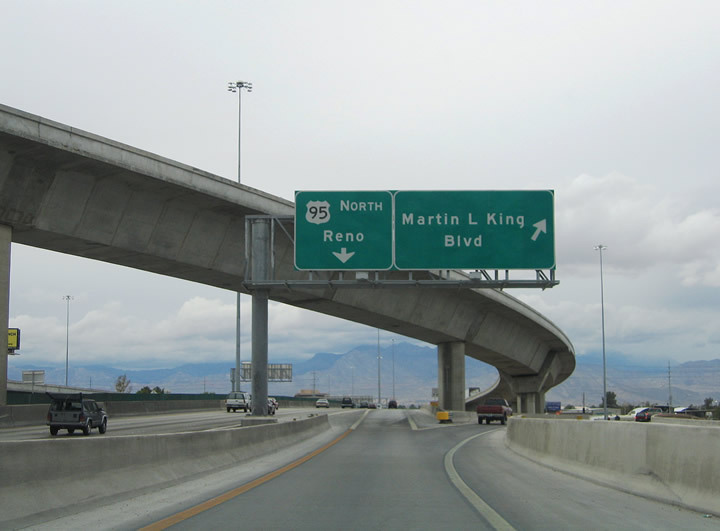 The ramp splits with roadways for the U.S. 95 (Las Vegas Expressway / Oran K. Gragson Expressway) northbound mainline and Martin Luther King Jr. Boulevard below. King Boulevard travels north from Oakey Boulevard and Nevada 159 (Charleston Boulevard) near downtown Las Vegas to Nevada 573 (Craig Road) in the growing suburbs of North Las Vegas. Photos taken 10/19/04. A look at the Interstate 15 southbound mainline through the Interstate 515 & U.S. 93-95 stack interchange. Interstate 15 travels independent of any U.S. highway from downtown Las Vegas to San Diego, California. Photo taken 10/19/04. 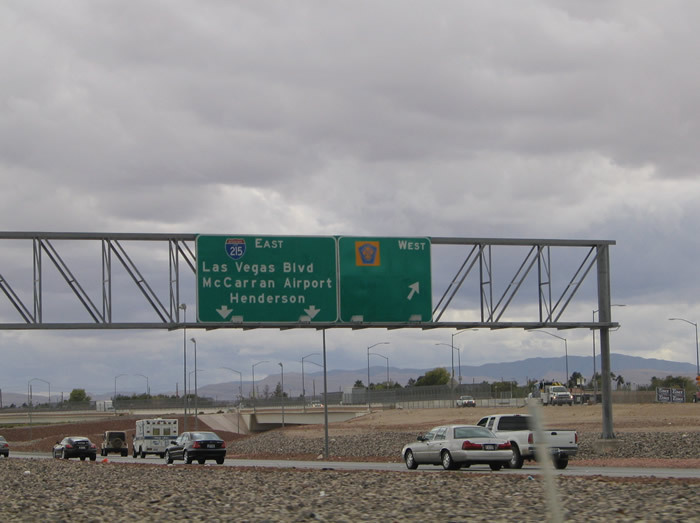 This upcoming exits sign lists the final two Las Vegas city interchanges and Spring Mountain Road on Interstate 15 southbound. Charleston Boulevard (Nevada 159) represents a busy surface arterial from Clark County 215 east to Hollywood Boulevard. 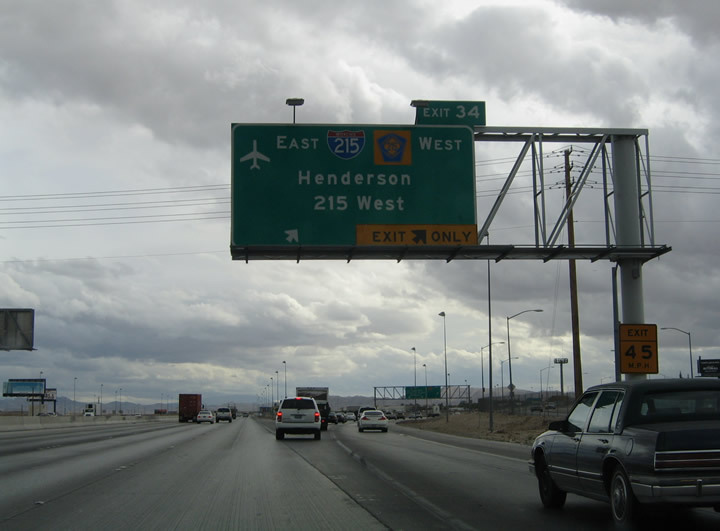 The east-west road carries Nevada 159 from the west city limits to Nevada 612 (Nellis Boulevard). Photo taken 10/19/04. 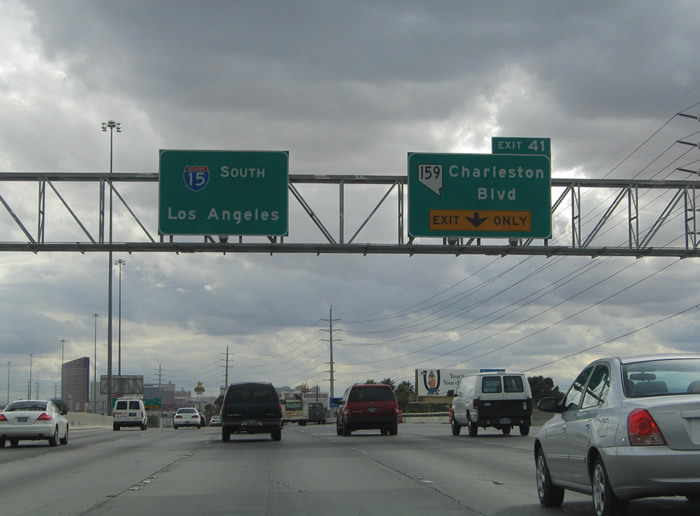 Drivers merging onto Interstate 15 southbound from Interstate 515 & U.S. 93-95 form the exit-only lane for Nevada 159 (Charleston Boulevard). Nevada 159 travels 31.516 miles from east Las Vegas to the Spring Mountains and Blue Diamond. Photo taken 10/19/04. Exit 41 departs Interstate 15 southbound in the form of a slip ramp onto the adjacent Martin Luther King Jr. Boulevard. Nevada 159 heads east to the Clark County Government Center (via Grand Central Parkway) on the 0.75 mile drive to Nevada 604 (Las Vegas Boulevard). The state route proceeds west 0.7 miles to Nevada 599 (Rancho Drive) and 2.9 miles to Decatur Boulevard. Photo taken 10/19/04. 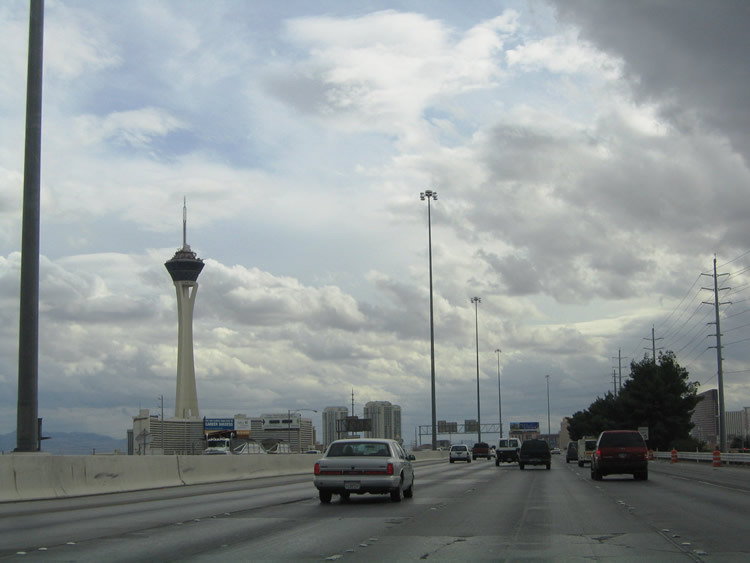 The Stratosphere Hotel and Casino represents the north edge of the Las Vegas Strip, Nevada 604 (Las Vegas Boulevard) from St. Louis Avenue / Main Street to Russell Road. The resort includes the Stratosphere Tower, at 109 stories, the tallest structure in Las Vegas. Photo taken 10/19/04. An on-ramp from Martin Luther King Jr. Boulevard merges onto Interstate 15 southbound ahead of Oakey Boulevard. The freeway continues south to Nevada 589 (Exit 40). Nevada 589 (Sahara Drive) represents the southern city line of Las Vegas. The east-west highway serves the Las Vegas Convention Center, situated on Paradise Road (former Nevada 605) at Desert Inn Road. Highland Drive stems south from Sahara Drive to Spring Mountain Road alongside Interstate 15 northbound. Photo taken 10/19/04. 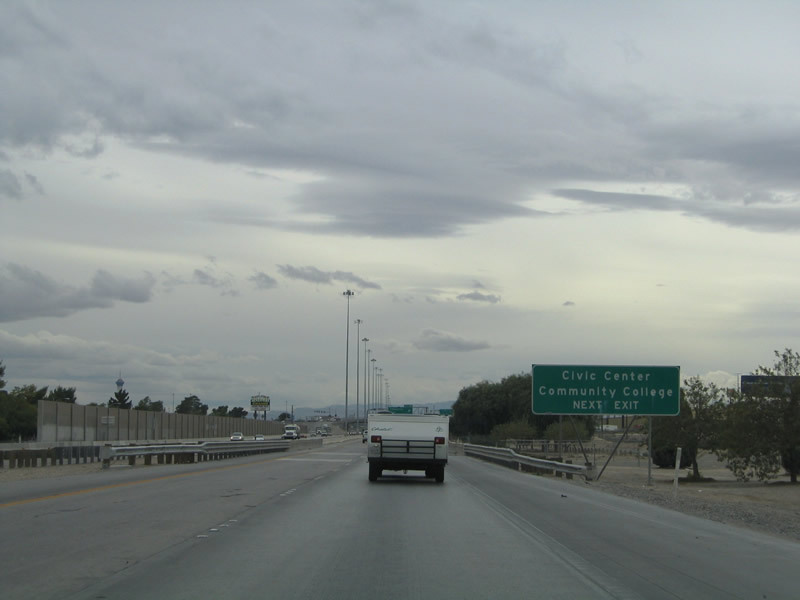 A two-lane off-ramp departs Interstate 15 southbound for Nevada 589 (Exit 40). Nevada 589 (Sahara Drive) ventures 10.010 miles between Nevada 595 (Rainbow Drive) and Nevada 612 (Nellis Boulevard). 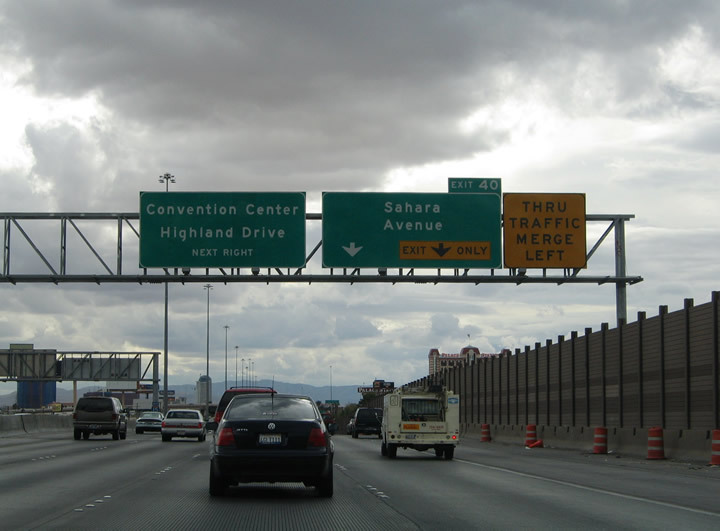 Sahara Drive travels the length of the metro area between the Las Vegas Beltway and Hollywood Boulevard. Photo taken 10/19/04. 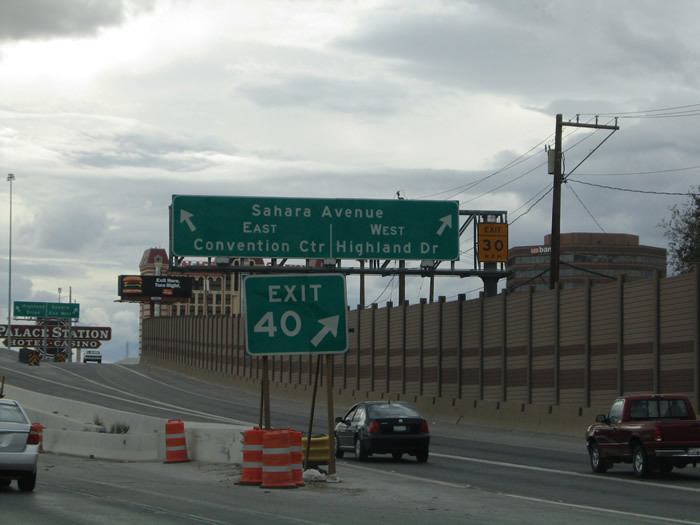 Exit 40 partitions into three branches: the ramp to Nevada 589 west, a loop ramp onto Sahara Drive east ahead of its intersection with Highland Drive, and a high-speed flyover to Nevada 589 east ahead of the Industrial Road folded-diamond interchange. Photo taken 10/19/04. 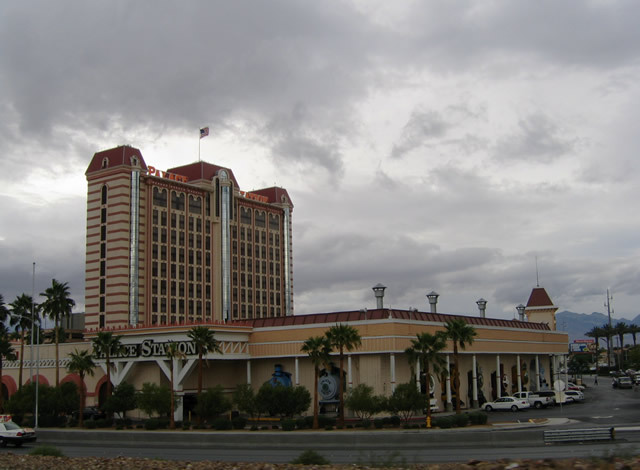 The Palace Station Hotel and Casino resides southwest of the Exit 39 directional-cloverleaf interchange with Nevada 589 (Sahara Drive) along Rancho Drive and Kings Way. Photo taken 10/19/04. 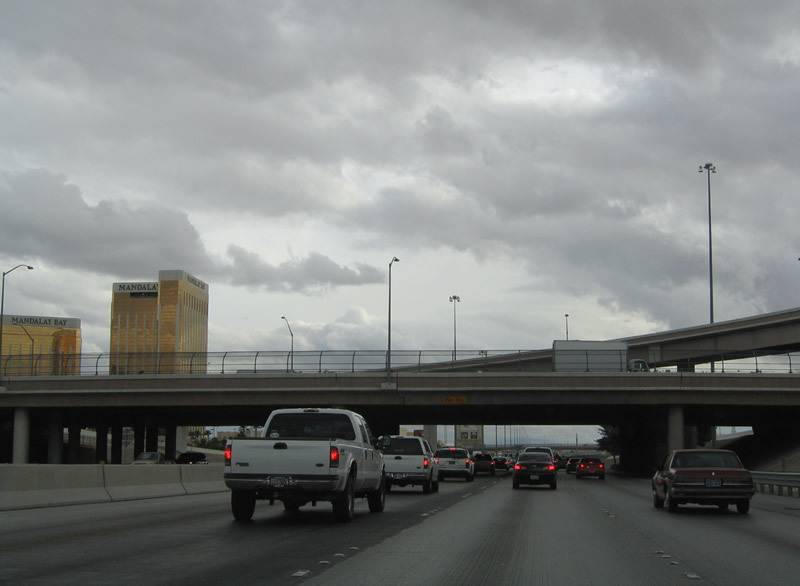 The next three interchanges all serve the Las Vegas Strip to the east of Interstate 15. 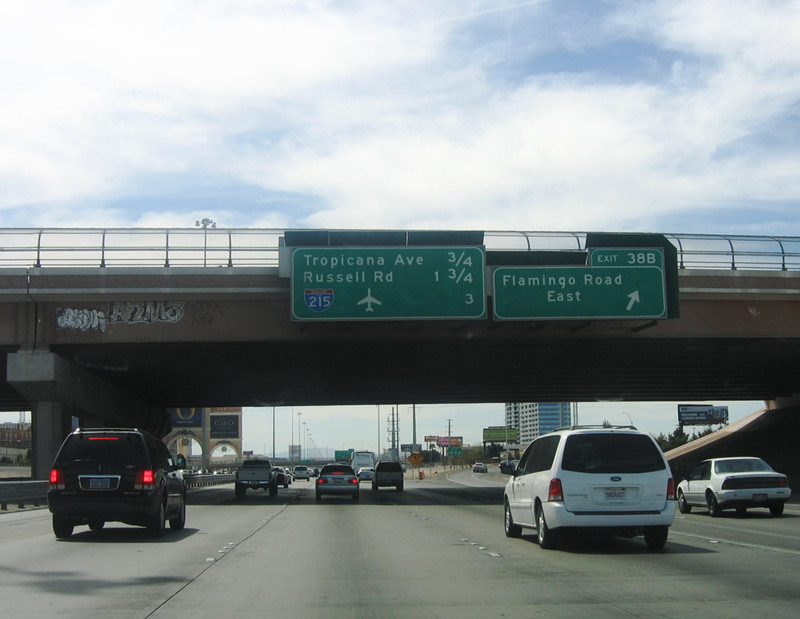 Intersecting the freeway ahead are Spring Mountain Road (Nevada 591), Flamingo Road (Nevada 592), and Tropicana Avenue (Nevada 593). Photo taken 10/19/04. One quarter mile north of the Spring Mountain Road directional-cloverleaf interchange (Exit 39). Only 0.242 miles of Spring Mountain Road are state maintained, the rest is managed by Clark County. The east-west surface arterial intersects former Nevada 604 (Las Vegas Boulevard) at Sands Avenue between the Fashion Show Mall and Treasure Island at the Mirage. Sands Avenue continues the divided highway east to the Sands Expo and Convention Center and Paradise Road (former Nevada 605). Photo taken 04/02/06. 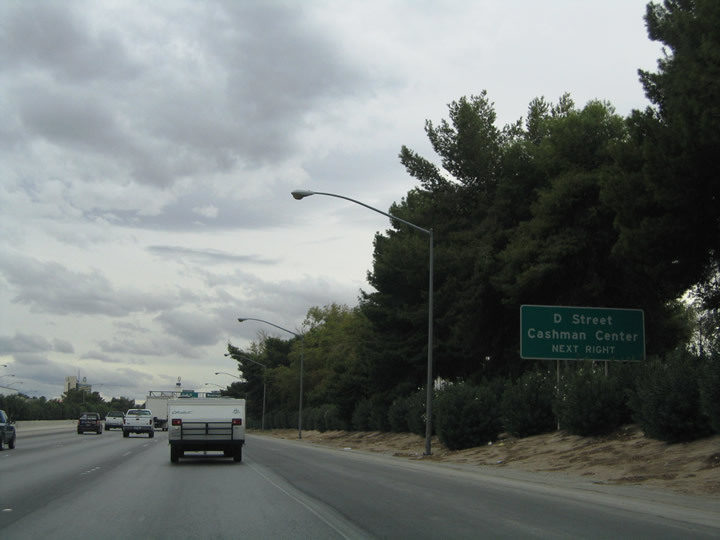 The Desert Inn Super Arterial passes over Interstate 15 ahead of the Exit 39 two-lane off-ramp to Spring Mountain Road. Spring Mountain Road continues west of the freeway one half mile to Valley View Boulevard, 1.5 miles to Decatur Boulevard, and 3.4 miles to Nevada 595 (Rainbow Boulevard). Photo taken 04/02/06. 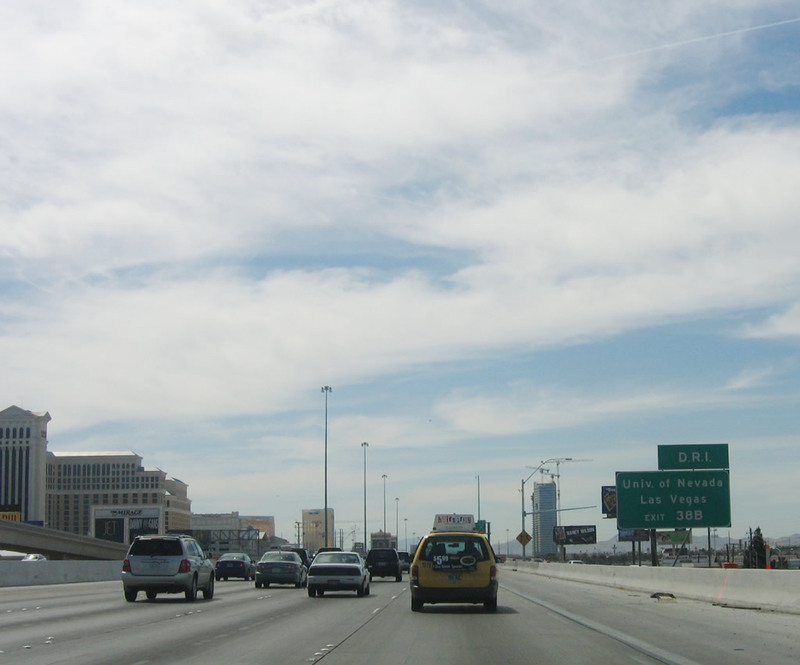 Exit 39 splits into a high-speed flyover for Spring Mountain Road eastbound to the Las Vegas Strip and simply ramp onto westbound. Spring Mountain Road passes over Industrial Boulevard and the Union Pacific Railroad line ahead of its intersection with Fashion Show Drive / Buccaneer Boulevard. Photo taken 04/02/06. Next in line for southbound motorists is the Exit 38A/B partial-cloverleaf interchange with Flamingo Road (Nevada 592). Nevada 592 provides the most direct route to the University of Las Vegas (UNLV) campus between former Nevada 605 (Paradise Road) and Maryland Parkway. Photo taken 04/02/06. 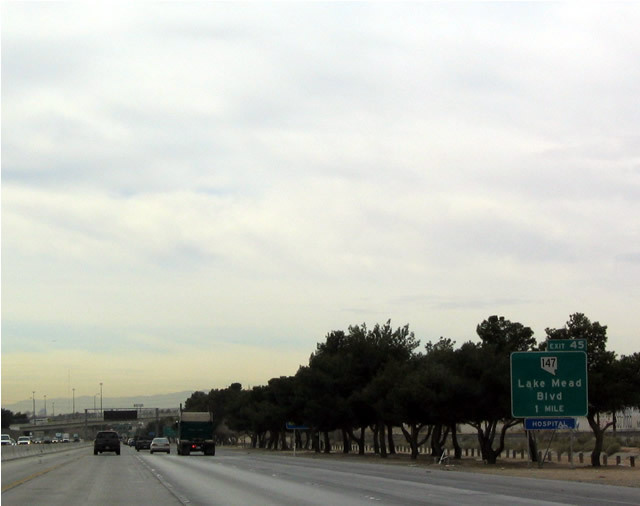 Exit 38A leaves Interstate 15 southbound for Nevada 592 (Flamingo Road) west. Nevada 592 ends at the intersection with Rainbow Boulevard (Nevada 595) in 3.3 miles. Flamingo Road continues from there another 3.5 miles to the Las Vegas Beltway (Clark County 215). Photo taken 10/19/04. 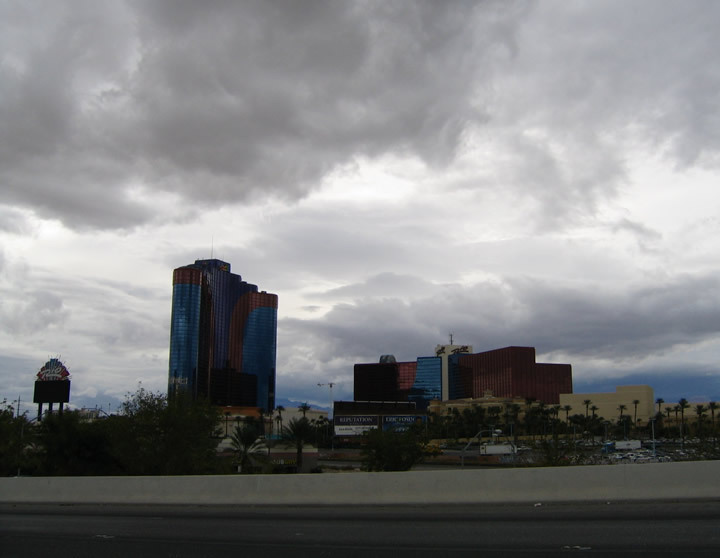 The Rio Suites Hotel and Casino lies west of Interstate 15 along Nevada 592 (Flamingo Road) at South Valley View Boulevard. Photo taken 10/19/04. A loop ramp carries drivers onto Nevada 592 (Flamingo Road) eastbound for the Las Vegas Strip and UNLV. Flamingo Road ventures east 1.5 miles to Paradise Road (former former Nevada 605) and the UNLV campus, 3.5 miles to Eastern Avenue, and 5.5 miles to Interstate 515 & U.S. 93-95 (Exit 69). Nevada 592 ends at Nevada 582 (Boulder Highway / old U.S. 93 & 95). Photo taken 04/02/06. An upcoming exits sign accompanies the Exit 38B overhead at the Flamingo Road overpass. 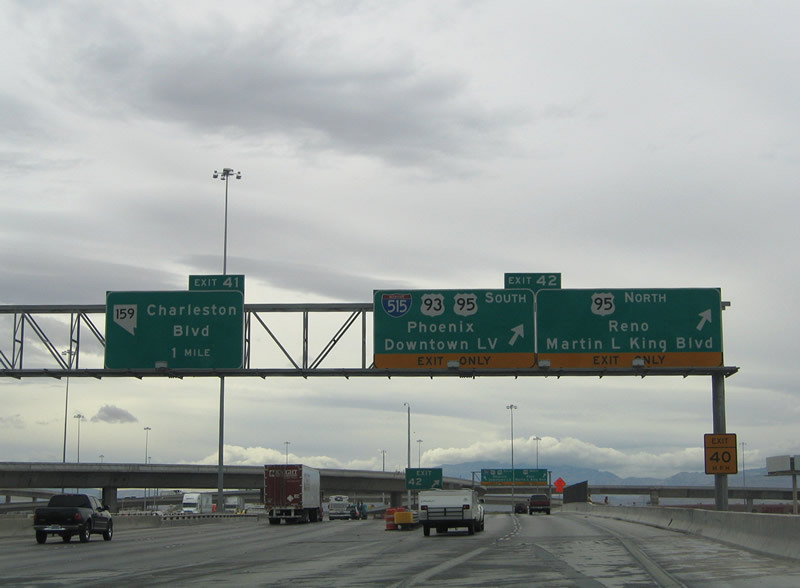 The sign lists the final two interchanges before Interstate 15 meets the Las Vegas Beltway (Interstate 215 east / Clark County 215 west). Like Interstate 610 in Texas, some Interstate 215 shields include the word "Loop" within the shield in place of the state name. Photo taken 10/19/04. 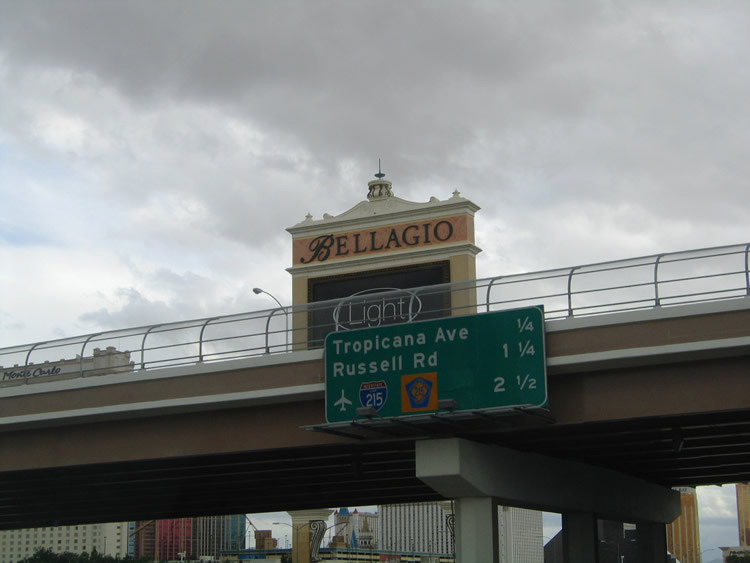 Large sign marquees for the Bellagio dominate the southbound skyline between Flamingo Road and Tropicana Avenue. 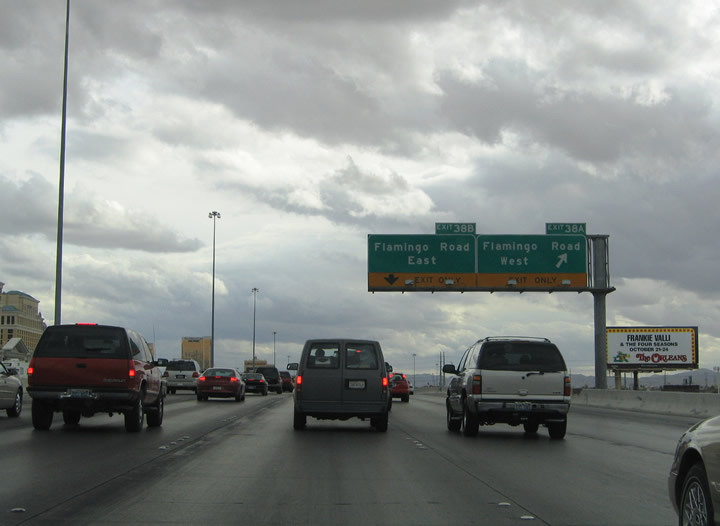 Traffic merging onto the freeway from Nevada 592 forms the exit-only lane to Exit 37 (Nevada 593 / Tropicana Avenue). 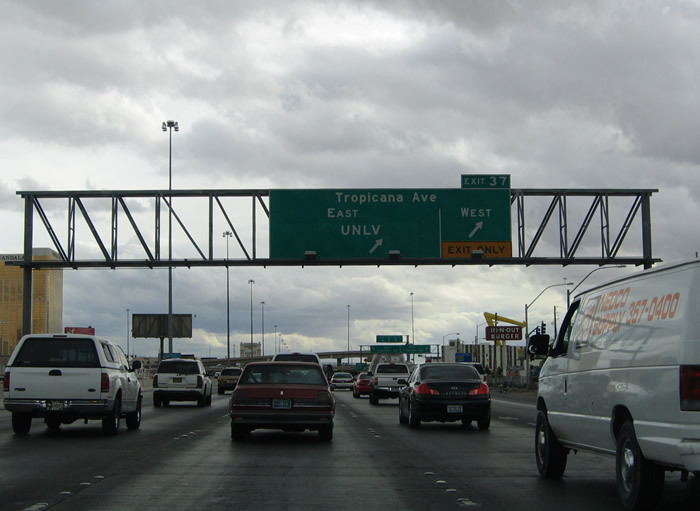 Tropicana Avenue provides a direct route to the Thomas & Mack Center on the UNLV Campus. Photo taken 10/19/04. A southbound Interstate 15 marker lies between the freeway and adjacent Industrial Road. The multi-lane Frank Sinatra Drive parallels the northbound side of the freeway between Russell Road and Twain Avenue. Frank Sinatra Drive was built in 2003. Photo taken 10/19/04. Attached to the Harmon Avenue overpass in the next in the series of upcoming exits signs. 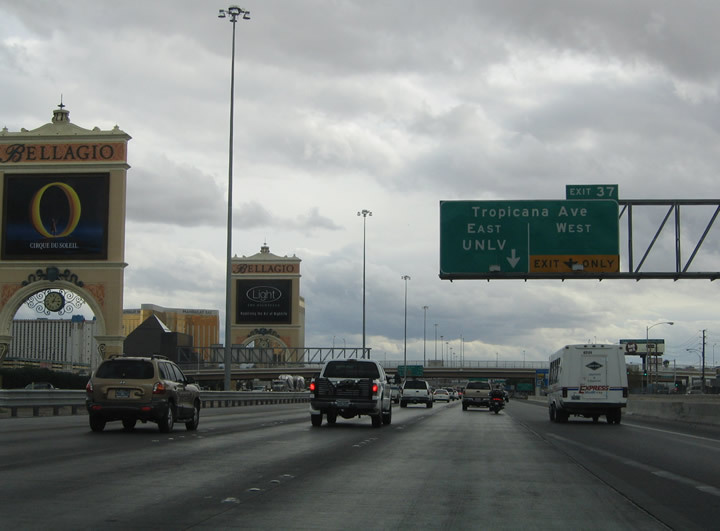 Exit 37 departs Interstate 15 southbound for Nevada 593 (Tropicana Avenue) in one quarter mile. Tropicana Avenue comprises an east-west surface arterial from Clark County 215 to Nevada 582 (Boulder Highway). The state maintains 7.492 miles of the road between Industrial Road and Boulder Highway. Photos taken 10/19/04. Traffic crawls ahead of the Exit 37 ramp departure to Nevada 593 (Tropicana Avenue). Tropicana Avenue intersects Nevada 604 (Las Vegas Boulevard) in the middle of the New York New York, Excalibur, Tropicana, and MGM Grand Casino complex. Nevada 593 reaches the UNLV campus at the intersection of Swenson Street in two miles. Photo taken 10/19/04. A high-speed flyover carries motorists onto Nevada 593 (Tropicana Avenue) ahead of the Las Vegas Strip. 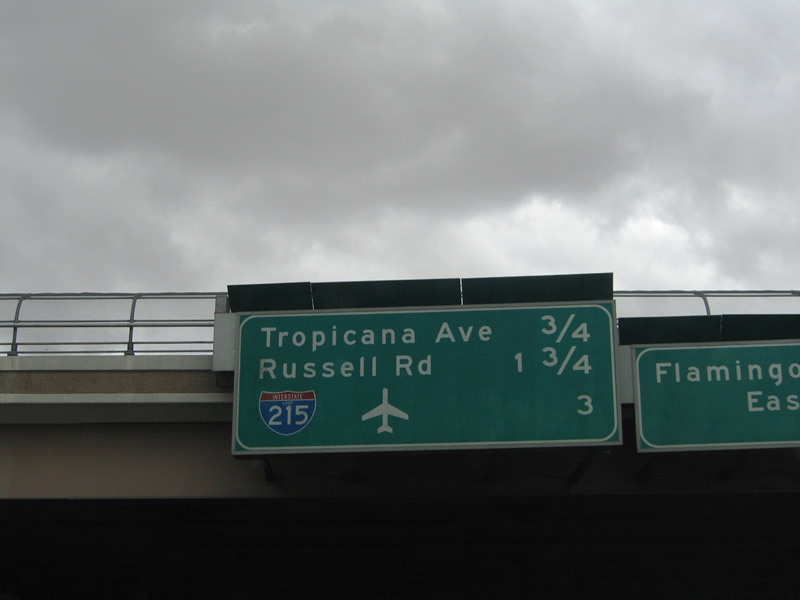 Frank Sinatra Drive passes underneath Tropicana Avenue but is accessible from Interstate 15 north. 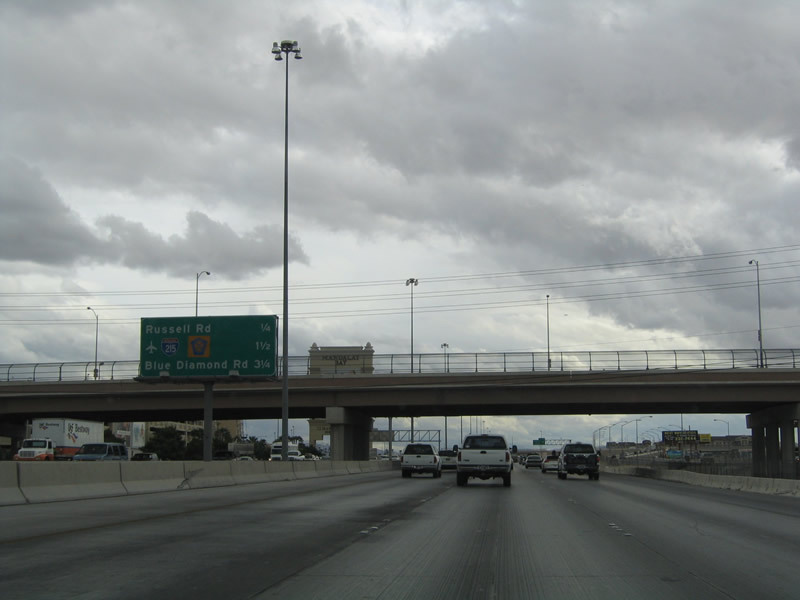 A diamond interchange facilitates the movements between Interstate 15 and Nevada 593 otherwise. Photo taken 10/19/04. One of the many casino skyscrapers rising to the east of Interstate 15 is the Mandalay Bay Resort and Casino shimmer. 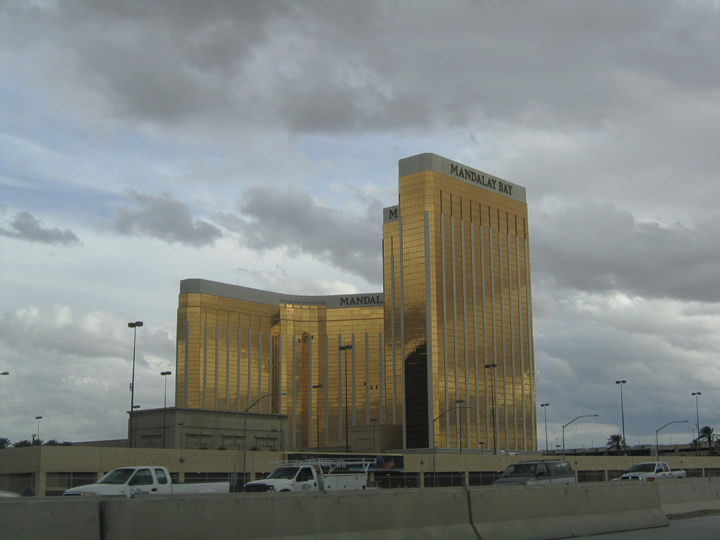 The golden tower resides adjacent to Interstate 15 between Hacienda Avenue and Russell Road. The building rises to 43 stories. Photo taken 10/19/04. 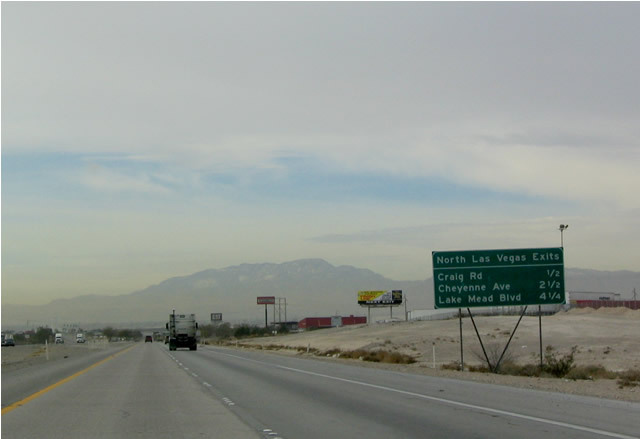 Mileage sign along southbound Interstate 15 for the next three exits: Exit 36, Russell Road; Exit 34, Interstate 215/Clark County Route 215; and Exit 33, Nevada 160/Blue Diamond Road. Hacienda Avenue / Mandalay Bay Road pass over the freeway beyond the overhead. Photo taken 10/19/04. 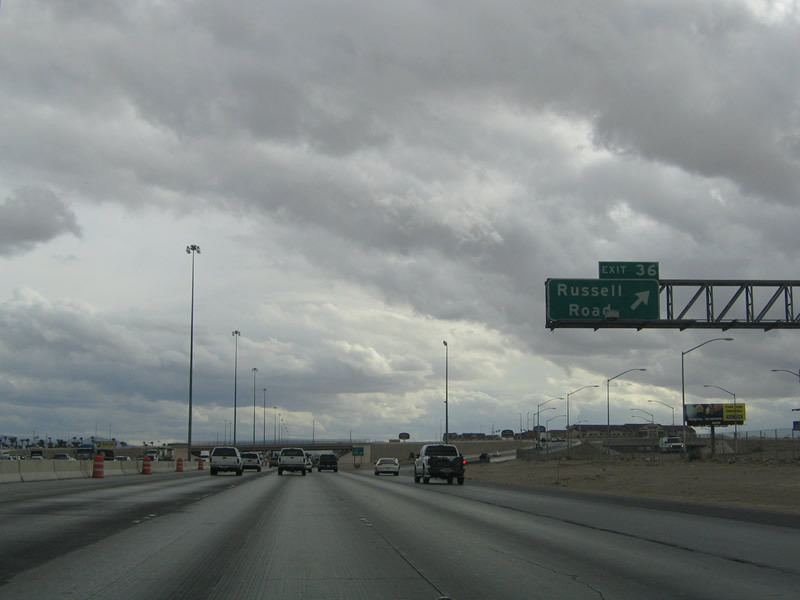 Southbound Interstate 15 at Exit 36, Russell Road, which connects with Las Vegas Boulevard near the Luxor and Mandalay Bay. Russell Road comprises a 1.9-mile long arterial between Decatur Boulevard and Nevada 604. 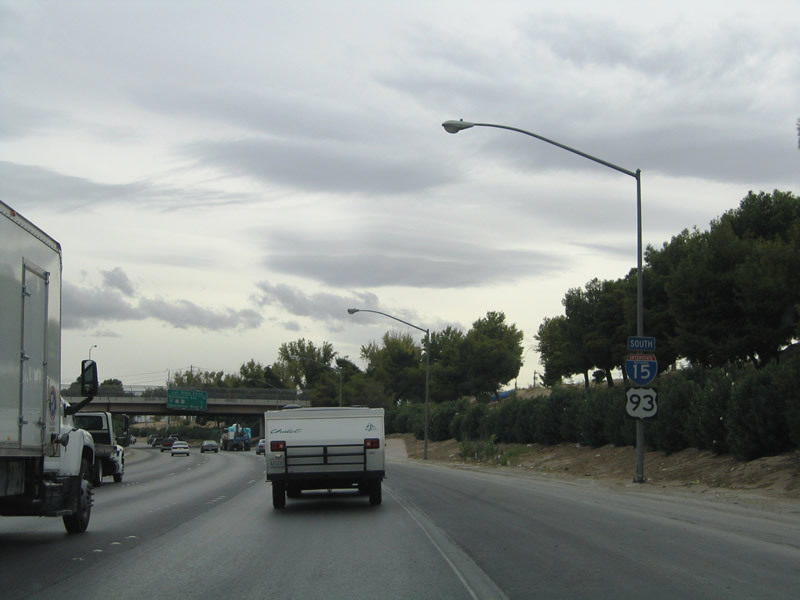 A diamond interchange provides the movements between Interstate 15 and the east-west road. Photo taken 10/19/04. 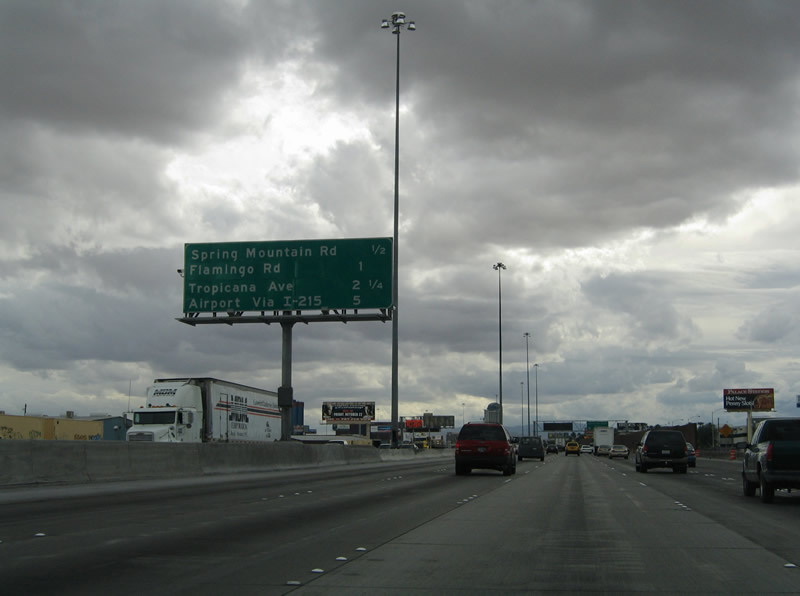 Roadside mileage sign along southbound Interstate 15 for the next three exits: Exit 34, Interstate 215/Clark County Route 215; Exit 33, Nevada 160/Blue Diamond Road; and Exit 27, Nevada 146/St. Rose Parkway west. A spur of the Union Pacific Railroad line crosses overhead in the distance. Photo taken 02/16/04. The exits sign pictured above was relocated onto a centerline overhead later in 2004. Interstate 15 proceeds southward one-half mile to a symmetrical directional-cloverleaf interchange (Exit 34) with Interstate 215 & Clark County 215 (Bruce Woodbury Beltway). Photo taken 10/19/04. The next exit along southbound is Exit 34, Interstate 215 east to McCarran International Airport and Henderson and Junction Clark County Route 215 west to the sprawling western suburbs and Summerlin. 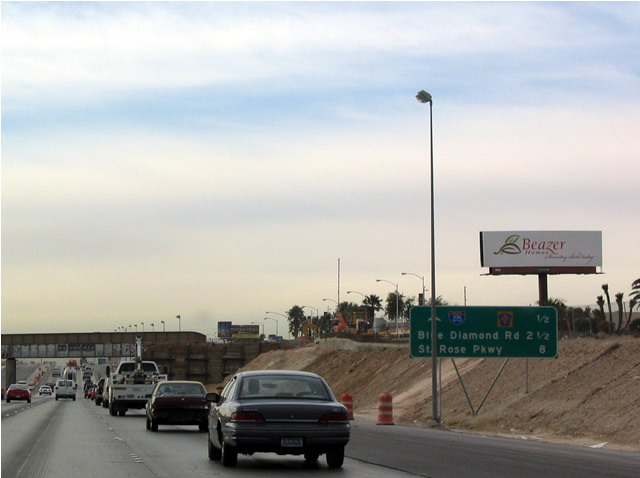 The county route, cobbled together with freeway, expressway, temporary frontage road, and surface street segments, forms a complete belt route around the western half of the Las Vegas basin. Photo taken 10/19/04. A look at the previous guide sign posted for Interstate 215. 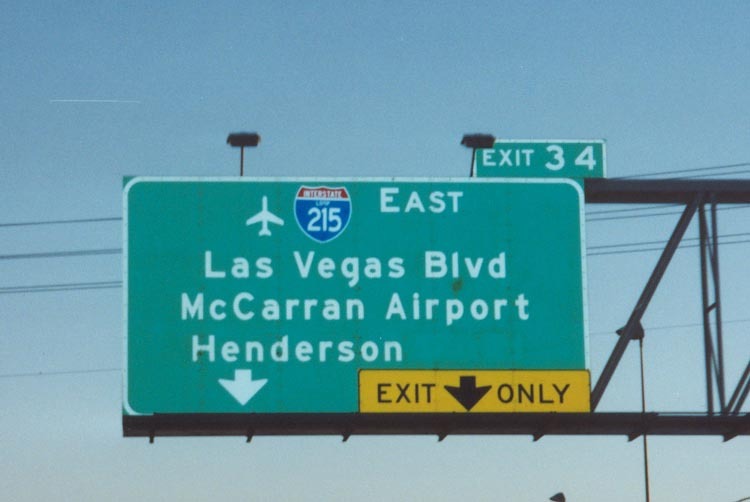 At the time Interstate 215 constituted a short spur east to Nevada 604 (Las Vegas Boulevard) and the Airport Connector to McCarran International with connections to Henderson via Nevada 146 (Lake Mead Drive). 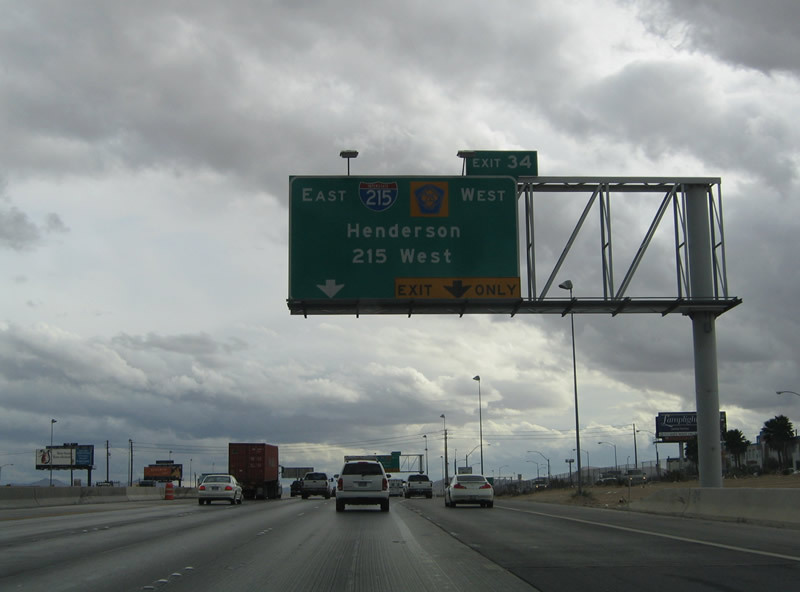 The sign was replaced to reflect the opening of Clark County 215 between Interstate 15 and Decatur Boulevard and Interstate 215 between Exit 34 and the city of Henderson. Photo taken 11/00. 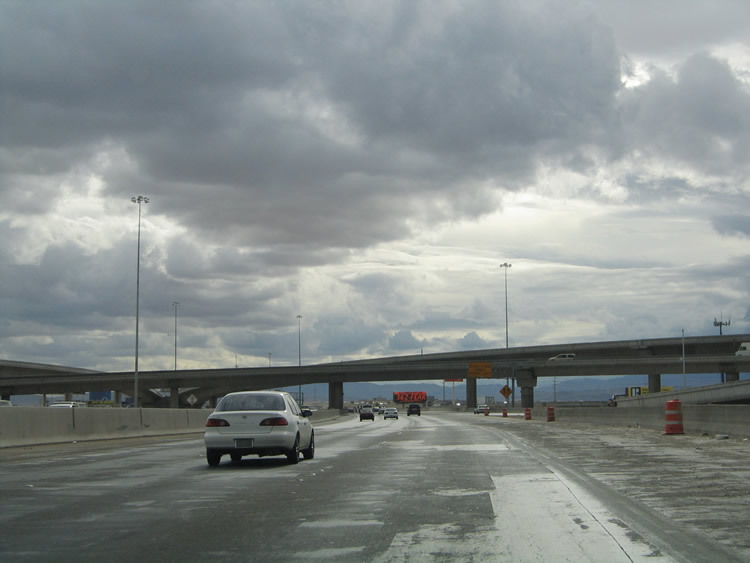 Interstate 15 maintains six overall lanes through the Exit 34 interchange with Interstate 215 & Clark County 215. Interstate 215 interchanges with Nevada 604 (Las Vegas Boulevard) and the Airport Connector within 1.5 miles. The Airport Connector provides direct access to the McCarran International Airport terminal. Photo taken 10/19/04. Exit 34 splits into ramps for Clark County 215 west and Interstate 215 east. Clark County 215 interchanges with Decatur Boulevard in one mile. Extension of the Western Beltway will occur in stages. The beltway will continue west to Buffalo Drive in 2004, to Charleston Drive by 2005, and to Craig Road by 2007. Completion of the entire route is tentatively planned for 2013. For additional information on the beltway construction and timetable, see Bruce Woodbury Beltway @ Dept of Public Works, Clark County, Nevada. Photo taken 10/19/04. Page Updated May 9, 2008.